Wow. I haven’t updated a single recipe in almost two months. How did all of that time pass so quickly? Well, never fear. January is here and New Years Resolutions are in force; get those recipes up! Starting off on a delicious note… How about a fresh, hot from the oven panakuken? What in the world is a panakuken, you ask? Ohhhh you’re in for a treat. A panakuken is a deliciously warm, sweet, eggy, puffed pancake, which is baked up in the oven and tastes like heaven in your mouth. Trust me. Pure heaven. When I was younger my family and I would often eat brunch at a restaurant called, “Panakuken.” It was this fantastic little breakfast place that served warm, delicious panakukens All. Day. Long. What could be better than that? Plus, when the waiters and waitresses came out of the kitchen with the fresh puffed pancakes, they would call “PAAAAAAAANAKUKEN!” incredibly loud (SO fun when you’re a kid) as they delivered the piping hot plates to your table. You see, the goal was to get the panakuken to your table while it was still puffed up high (they fall after a few minutes). It was always exciting when they would get mine to the table before it fell flat… it’s the simple things. Blueberry, Strawberry, Apples and Cinnamon, the varieties were endless, and each was equally as amazing. Despite this endless array, however, my younger sister and I would always order the plain panakuken, and douse it in powdered sugar. It was incredible… at least for us. My dad would always tease us, calling our breakfast a desert (no, not dessert) because of the lack of syrup and butter and the copious amounts of powdered sugar. Fine. He was probably right… but at 10 years old, pure powdered sugar is all a kid could ask for! The other day I was inspired to recreate that fantastic original panakuken. However, this time I decided to follow in my dad’s footsteps and top it with warm maple syrup. He was right; it’s better that way. This recipe is ridiculously easy, and it is basically fool proof. Plus, I am going to share with you the simple secret trick to a perfectly puffed panakuken… Are you ready? Put the milk in the microwave for about 20 seconds. Meanwhile, have your eggs (still in their shells) sitting in a glass of hot water to help bring up their temperature too. (Or, if you remember ahead of time, take them out of the fridge to come to room temperature) That’s all it takes, really! Now go try it. 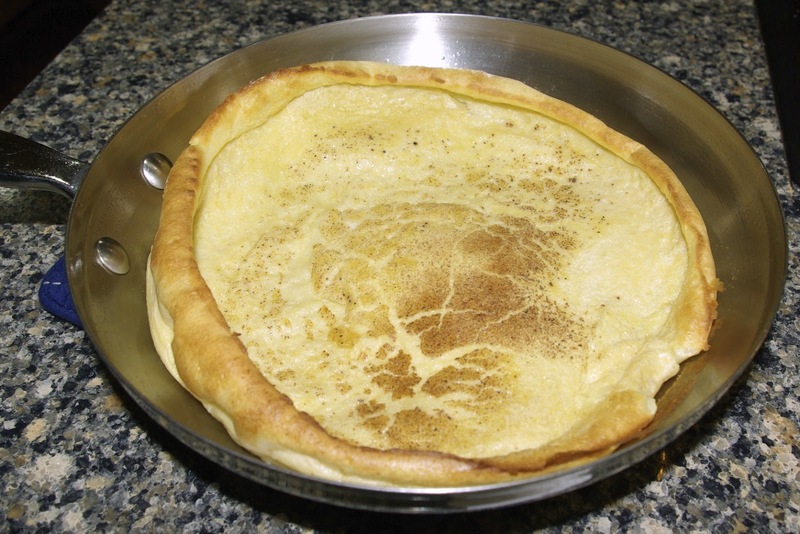 Spray an oven-proof 10 inch skillet with cooking spray. Put butter in skillet and place in oven to melt, allowing the skillet to warm. In a medium bowl, beat eggs with a whisk. Slowly whisk in flour, nutmeg and salt. Remove skillet from oven and pour the batter in to the skillet. Bake until puffed and lightly browned, about 12-15 minutes. Remove promptly and serve with powdered sugar and warm maple syrup. I found this post today when I was trying to explain what Panakuken’s are to my southern husband and kids! I agree up in Minnesota and we had a Panakuken Restaurant. I can still smell their sweet smell and I can hear the panakuken call in my head. Was that restraint in Bloomingtin Mn. ? Ate there many evenings while working near by. Great food and and the call was also great. Thanks for the memories.